The names listed on Freedom Wall were hand-lettered by a single craftsman from northern Indiana. Question-asker Dominique Lewis asked about the large banner of names on the city's Near North Side and Adam Brooks, right, the artist behind the piece, helps with answer. Adam Brooks' Freedom Wall is set against a wall that houses the Nacional 27 restaurant. If you ride the Brown Line or the Purple Line through Chicago’s River North neighborhood, you’ve probably seen this list of names. It’s on the side of a brick building on Huron Street, where the Nacional 27 restaurant is located. The black banner stretches 72 feet high. Martin Luther King is at the top. Farther down, you’ll see Harriet Tubman, the Dalai Lama, Frank Zappa, Ayn Rand and more. Dominique Lewis caught glimpses of those 69 names in white letters — as well as one mysterious blank line — as she rode the Purple Line to work every day. “I thought, ‘That’s weird. Why is Rush Limbaugh on a list with Martin Luther King Jr.?’” she says. So she asked Curious City to investigate the list&apos;s history and whether there&apos;s a common theme that connects those names. Well, it’s called Freedom Wall, and all of the names represent freedom ... or someone’s idea of freedom, anyway. The artist who created it — Adam Brooks, a Columbia College professor who grew up in London — says he didn’t have a partisan political agenda when he put up the list 20 years ago this August. In fact, he went out of his way to include conservative as well as liberal opinions about who represents freedom. And he avoided spelling out the word “freedom” on the banner because he wanted to make people think. He certainly got Lewis thinking. Brooks acknowledges that Freedom Wall prompts some people to ask, “Wait, that’s supposed to be art?” But he appears to have very little ego about his artwork, not even bothering to sign it. Brooks is trying to engage the public with his public art, not to dazzle people with his artistic prowess. 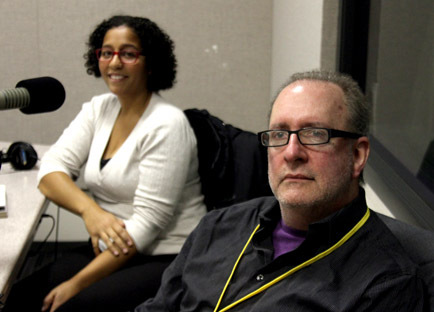 We invited Brooks to the WBEZ studios to discuss Freedom Wall. Lewis joined us for the conversation and added some questions of her own. Here’s an edited transcript of our discussion. Why did you create Freedom Wall? Brooks: In 1992 and the lead-up to the presidential election that year, I heard the candidates really ramping up the idea of freedom. Of course, who’s going to be against freedom? America is the land of the free. I was interested in exploring that word a little bit further. Why did you seek other people’s opinions? The Internet was really in its infancy then as a communicative medium. I posted this question on America Online, and in relatively short order, people started responding — particularly teachers, who were early adopters of the technology in their classrooms. The rank of the names on the list is essentially reflective of the frequency of nomination of those names. So Martin Luther King received the most votes. Lewis: Did you have favorite names on the list, people who stood out for you for exemplifying freedom? Brooks: As far as I’m concerned, that question is not pertinent to the project. Undoubtedly, personally I do, but because of the way that I work I don’t take an ideological or other particular stance. I’m interested in asking questions, and not posing answers. That, to me, is what art making is about — is to ask questions. And so, while certainly there are some people that I feel affinity with on the list more than others, I don’t feel that it’s really important for me to give you a specific answer. It was very important to me that there was no alteration, omission or any other kind of tampering with the results on my part. The only thing that I had to make decisions about was when specific names got the same number of nominations — how to rank them next to each other. So putting Anita Hill and Rush Limbaugh together, because they did get the same number of nominations, was quite delicious to me. Other than that, it’s completely straight. Lewis: Did any of the names you received shape or change your ideas of freedom? Brooks: There was one set of answers from a German artist who was living in Chicago at that point in time, who was always a bit of a jokester. His three names were Stalin, Louis XIV and Hitler. And his rationale was that those three individuals created worlds in which they had absolute freedom to do whatever they wanted to do. And while that’s an extreme response, I think that it’s just as valid as any of the other responses that I received. Why is there a blank line under Frank Zappa? Brooks: I think six people responded saying that they really didn’t feel that one name could sufficiently embody the idea of freedom. And in fact, one respondent actually said she didn’t know what freedom was and seriously doubted that it existed. And so it was important to me to recognize the fact that actually some people refuse to participate. In hindsight, it also functioned as a space into which passersby could potentially, mentally, insert their own choice. 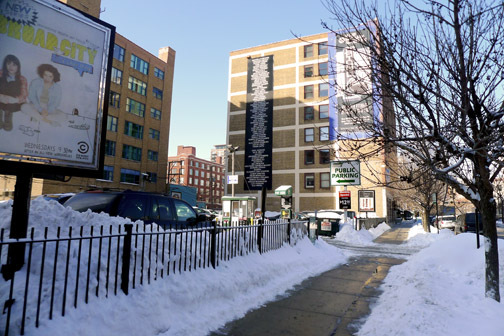 How did Freedom Wall end up at this location on Huron Street? Brooks: The building at that time was owned by Buzz Ruttenberg, who has been a longtime supporter of the arts in Chicago. And the gallery that I was affiliated with at that time, the Rhona Hoffman Gallery, was actually in that building. Rhona and Buzz and I sat down and talked about the project, and without any hesitation, Buzz said, “Yeah, it’s fine, just make sure that it doesn’t deteriorate.” And I assured him that the technology had reached a point where it would not be peeling off — and indeed, it still looks pristine 20 years later, which is kind of amazing to me. Lewis: Did the train [The CTA Brown Line] pass by the original site? Brooks: No. So in the end, it worked out very well for everyone concerned. Because being able to see it from the train is a huge advantage in its visibility, and I’ve always liked the idea that it’s a fleeting experience. How did you choose the font? Brooks: The font is Helvetica, which is one of the most common sans-serif fonts. Helvetica is probably the most ordinary font there is. I want people to look at the information and not think about the font at all. Why did you put this list of names up without any explanation on the wall? You don’t have the word “freedom” anywhere to explain what this is all about. Brooks: I believe that art should not be a spoon-feeding process — that people should do some work, at least, to gain access to the kind of work that I make. 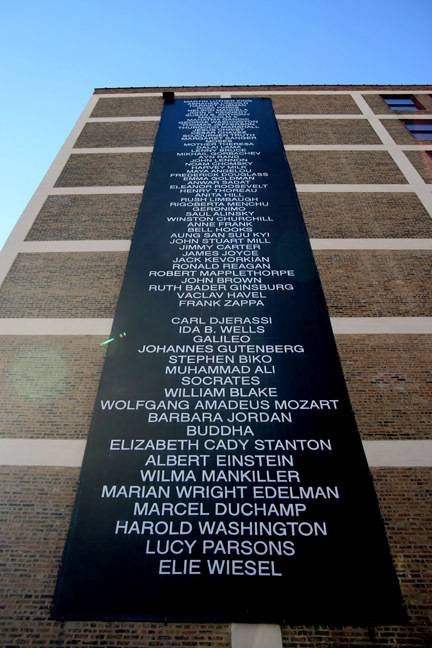 Neither do I want it to be purposefully opaque or obscure, but asking passersby and viewers to do a bit of work to make connections between all of the names on that list is one of the essential components of the project for me. Brooks: And that’s all I can really ask for. And if in some small way, I can lodge a question in people’s heads and make them think a little bit, that’s quite sufficient for me. Lewis: I don’t see your name anywhere on there. Was that on purpose — is it somewhere hidden? Brooks: It’s not hidden. It’s not there. The idea of signing one’s work is a modernist conceit, and I’ve never signed my work — except maybe when I was in college 30-plus years ago, because that’s what I was told I needed to do. But in pretty short order, I realized that that wasn’t important, that the work itself was the signature. And if people are interested enough, they will find out who made the work. Lewis: That’s what I did. Brooks: For me, one of the most fascinating things about this whole project was going to northern Indiana, into a huge sign-painting warehouse and spending a day watching the one late-middle-aged man hand-letter each one of these names with a 3-inch-wide brush. Because he had been making these letters on billboards for 30 years, it was amazing watching him do it — absolutely precise and really fast. He did six names an hour. This painter’s name was Bob Morales. How does Freedom Wall relate to the art you’ve done recently with Industry of the Ordinary, your collaboration with Mathew Wilson? Brooks: Freedom Wall was the first open acknowledgement that I’m interested in reaching as wide an audience as possible — and presenting work that often does not even appear to be art. Asking questions about what art is — and whether it can function outside of the confines of the white-walled gallery. Who represents freedom to you? Which names would you put on a new version of Freedom Wall? Suggest names here. Correction: An earlier version of this story misspelled the name of Adam Brooks&apos; collaborator. The correct spelling is Mathew Wilson. Additional editor&apos;s note: After reporting this story, Curious City was informed that the current owner of the building that Freedom Wall is installed upon is the Conant family. That family is the backer of the Doris and Howard Conant Fund for Journalism, which supports Curious City through contributions to WBEZ.